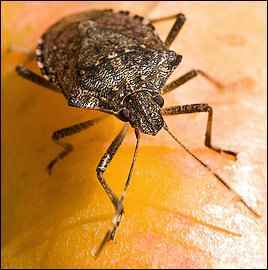 Shaped like shields and armed with an odor, dime-size brown bugs are crawling into area homes over windowsills, through door crevices and between attic vents in such numbers that homeowners talk about drowning them in jars of soapy water, suffocating them in plastic bags or even burning them with propane torches. In the process, some people are unwittingly creating another problem: When squashed or irritated, the bugs release the distinctive smell of sweaty feet. Get used to it, experts say: The invasion is only going to get worse. "This is the vanguard," said Mike Raupp, a University of Maryland entomologist and extension specialist. "I think this is going to be biblical this year," he said wryly. "You're going to hear a collective wail in the Washington area, up through Frederick and Alleghany counties, like you've never heard before. The [bug] populations are just through the ceiling."